Our area we hunt went to a trophy mountain lion draw, which has allowed us the best mountain lion hunting in the country. This allowed our lion population with its already amazing genetics to produce some of the biggest mountain lions we have ever harvested and allows us to be patient on the lion we decide to harvest. Our mountain lion hunting area is over (2) million acres and has been phenomenal giving our clients 100% opportunity with lions treed. The Special Draw mountain lion draw takes place in July. Contact our office for specific districts to apply for. If you are doing a quota hunt this hunt takes place In February and this is an over the counter license. Do to over population of lions half of our area we hunt lions went to over the counter where you can purchase a lion license and hunt starting February 1st. We have highly trained hounds, top-notch equipment and the best guides Montana has to offer for this hunt. The method of hunting is to cover as much country at night to ensure fresh mature Tom tracks by daylight. At daylight you will be able to hear the hounds erupt and the next time you will see them is at the base of a big pine tree with your trophy lion high above. This is the most exciting and popular hunt we have to offer. All hunts are one guide to one hunter to ensure the hunt of a lifetime. 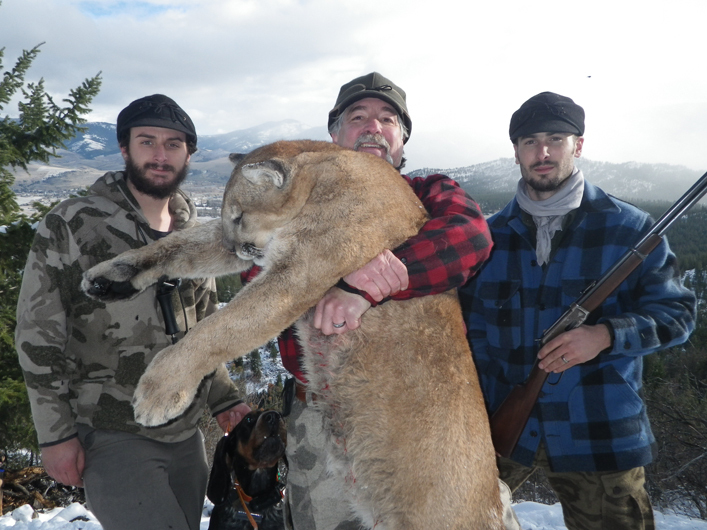 Whether you decide to put in for the trophy lion draw or come on a quota based mountain lion hunt, with Cody Carr’s Hunting Adventure’s this will be the best and most exciting mountain lion hunt you will ever experience. Remember to put in each year as your points are squared which increases your chance of draw.